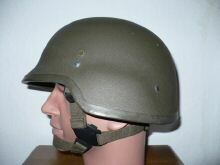 "Schuberth 826 for Pakistan. 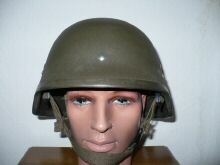 In July 1997 Schuberth attempted get a contract from Pakistan. 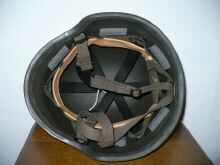 The helmet has the US style suspension with black plastic bands, the leather band is marked with 54-59 for the size. 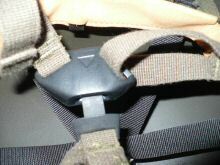 The holes for the NOSHA suspension are drilled in the shell but they are filled up again. 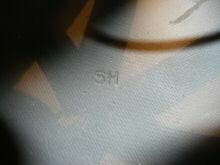 Inside the crown you find the company marking SH, it is short for Schuberth Helme. 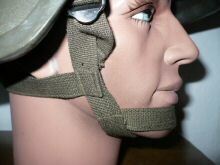 Strange are the foam pads to protect the wearers head. 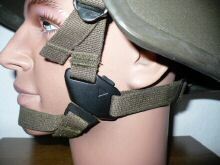 The chin strap has no survival buckle and a lock that is called by Schuberth the 'sniper lock'. It is very flat so the soldier has no problem to use his rifle."